Good luck to all the youth hunters this weekend! I haven't heard any shooting............. Where are they? I saw on FB that Marcus "Latimerfirefighter" took his daughter and she got her first. She is about 6. That's so great. Sure glad the girls are included now. I’m at work, but my 14 year old niece got a doe yesterday afternoon on our place. Congratulations to the young lady. Thanks! I will pass it on. 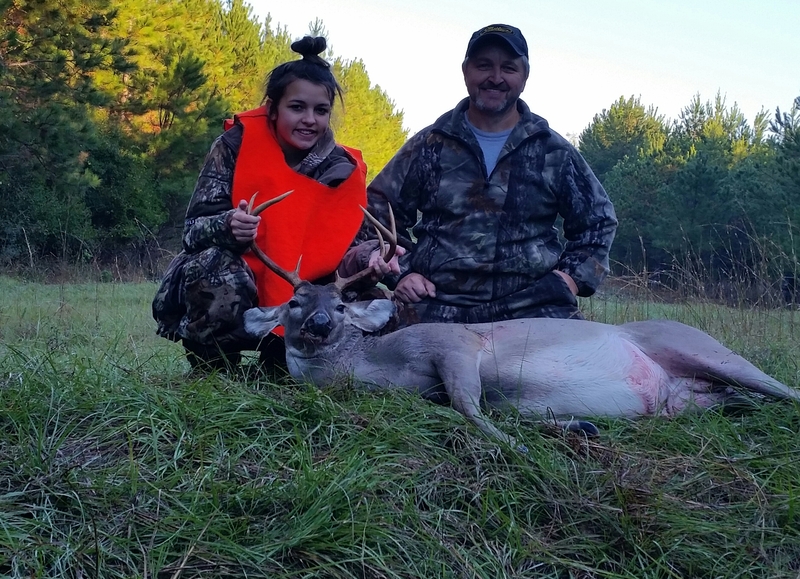 My 15 year old grand daughter got her biggest buck to date Saturday morning at 7:00. He was a 150lb 8 point! We had 4 bucks cross a gas line and she shot the biggest one. Hit him great with the 30/06 but we weren't able to find any blood at all. We finally stumbled onto him in a low spot in the pine thicket. that's awesome dublelung.. i hate that sinking feeling when you know you hit a deer but can't find any blood..
My 9 yr old didn’t wish to partake. Almost broke my heart. Went by myself and got sick due to all the mosquitoes that tried to take me out. That is great! I love seeing young ladies kill good deer. Congratulations to them! Love the facial expressions!